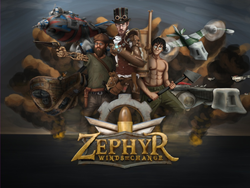 On March 29th, emerging board game development company Portal Dragon launches Zephyr: Winds of Change on Kickstarter. This one to four player cooperative modular tabletop adventure places players in the role of a steampunk airship captain. Jon Mietling and Aaron Kluck, co-founders of Portal Dragon, are returning to Kickstarter to seek funding for their new board game, Zephyr: Winds of Change. Gamers looking for a cooperative experience that allows each player to make their own decisions while still contributing to the team's overall goals need look no further. Zephyr has been in development for over three years, and its crowdfunding campaign will launch on Kickstarter with artwork and development complete. The campaign features over 250 opportunities for supporters to appear in and/or influence components of the game. Backers can receive a copy of the game starting at $49, with free shipping to individuals in the US, and just $3 to Canada, Germany, and the United Kingdom. Zephyr: Winds of Change is a cooperative modular tabletop adventure for one to four players. Each player takes on the role of an airship captain. Players upgrade their ship and hire crew members which augment their ships base abilities. As the game progresses, enemies become more difficult but yield higher rewards. Each mission players undertake in Zephyr brings unique challenges and enemies that players must work together to overcome.